Picked from the uppermost branches of the pepper tree, these bold black peppercorns are the most developed, sun-ripened and flavoursome berries from the bush. They have then been dried and graded into sizes, just to double check that we have received nothing but the boldest of peppercorns. 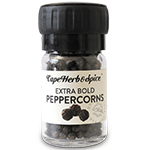 Chefs around the world regard these as the premium quality peppercorns, go on, try them and you'll understand why.